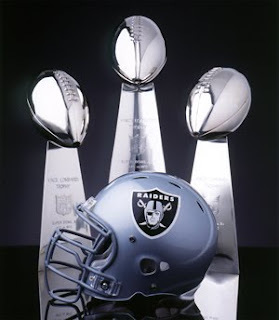 Discussion in 'Oakland Raiders' started by 3rdStoneFromTheSun, Jul 18, 2011. What a long and strange trip is has been for the Oakland Raiders. Born in 1960 in the expansion American Football League, the Raiders were first destined to call Minneapolis, Minnesota home. Yet the NFL countered by starting the Minnesota Vikings franchise. Los Angeles Chargers owner Barron Hilton told the AFL he would rescind his franchise if the league did not get another West Coast team. There were few football stadiums that were appealing for professional football in California at that time. The city of Oakland asked for the Raiders after a group of businessmen formed a group to purchase the team. They played their first season across the bay in San Francisco and even played their last three games on the NFL's San Francisco 49ers turf in Candlestick Park. After a rough start, the Chargers helped the Raiders again. Al Davis was an assistant coach to Hall of Famer Sid Gillman with the Chargers. Davis was named the general manager and head coach. The team started to improve, but Davis accepted the job to be AFL commissioner. The job was short lived because the AFL decided to merge with the NFL. Davis returned to the Raiders after buying a stake in the teams ownership. Becoming a powerful team by this time, under head coach John Rauch, the Raiders won the 1967 AFL title before heading to the second ever Super Bowl and losing to the Green Bay Packers. The team continued to be one of the best in football, but it would take until 1976 for them to reach another Super Bowl. After winning it all that year, the Raiders won Super Bowls in 1980. Davis had now become the managing general partner of the Raiders and was unhappy with the Oakland Coliseum. He moved the team to Los Angeles. Though an unpopular move for the city of Oakland, Los Angeles accepted the Raiders with open arms. The city now hosted the Raiders and the Rams together. The Rams, who had been there since 1946, battled the Raiders for fans allegiance. Oakland gained an edge by winning the Super Bowl in 1983. Though the Rams won a title in 1951, it would be the only championship they secured until moving to Saint Louis in 1995 and winning it all in 1999. Oakland struggled somewhat after the 1985 season as they tried to rebuild. An 8-8 season was their best until 1989. Rumors of their return to Oakland began around that time and was a reality in the 1995 season. Since then, it has been a bit of a roller coaster ride. The team did reach the Super Bowl in 2002 and lost. They began to struggle after that season and eventually became the first team in NFL history to lose at least 11 games in seven straight seasons. Some fans of the Raiders think the 82-year old Davis is a lot like Bear owner George Halas was toward the end of his career. Out of touch and stubborn in his ways. Other fans do not question the wisdom of the Hall of Famer and live by his created slogans like "Pride and Poise," "Commitment to Excellence," and "Just Win, Baby". With the teams recent improvement in 2010, it seems Davis has plenty left in his tank to give to his beloved Raiders. This is a team rich in tradition and history with some of the most loyal fans in all of football. They have witnessed some of footballs greatest and even most controversial moments with their team. There was the infamous "Heidi Game" in 1968, when the NBC network decided the New York Jets had the game in hand late in the fourth quarter and switched to a movie. The Raiders would storm back and win. There is the "Immaculate Reception" in 1972, when the Steelers returned a deflected pass for a score late in a playoff game. Fans still question whether the ball touched the Steelers or Raiders first. There is the "Sea of Hands" play in 1974, where halfback Clarence Davis caught a fluttering touchdown pass to win the game while three Miami defenders dove for the ball in a playoff game. There is the "Ghost to the Post", where Hall of Fame tight end Dave Casper made a crucial 42-yard catch as time was expiring in double-overtime against the Baltimore Colts. The Raiders tied the game and Casper caught the winning touchdown in the next overtime period. It is the fourth longest game in NFL history and was the last playoff game ever for the Baltimore Colts. There is the "Holy Roller" in 1978, where three Raiders fumbled the ball forward before falling on the ball in the end zone for the winning score as time expired. There is the "Red Right 88" play where Cleveland Browns quarterback Brian Sipe was on the Raiders 13-yard line with less than a minute to go in a 1981 playoff game. Instructed to throw the ball away if the play wasn't there, Sipe tried to force the ball to Hall of Fame tight end Ozzie Newsome and had the ball picked off by the Raiders Mike Davis. There is the "Tuck Rule Game" in a playoff game in 2002 against the New England Patriots. Played in the snow, Patriots quarterback Tom Brady appeared to fumble the ball in a tie game. Oakland recovered the ball, but the referees declared that Brady's arm was going forward and it was an incomplete pass, allowing New England to kick the game-winning field goal shortly thereafter. Many of these plays had impact on the game afterwards, as the NFL made rule changes to prevent them from happening again. The one thing that is certain is that the Raiders seem to be in the middle of some of footballs most historic moments. Remember : this is a team of players who are not members of the Pro Football Hall of Fame. Stabler was drafted by the Raiders in the second round of the 1968 draft. With Daryle Lamonica entrenched firmly as their starter, Stabler joined the Spokane Shockers of the Continental Football League. When the league ceased operations after the 1969 season, Stabler joined the Raiders and appeared in three games. He started one game the next season and won. He lost his lone start the next year but played more than he had before. Oakland started him 11 games in 1973 and led the NFL with a 62.7 completion percentage. He was also named to his first Pro Bowl. The 1974 season was one of his best, where he went back to the Pro Bowl and earned his only First Team All-Pro nod. He led the NFL with 26 touchdown passes, a 8.4 touchdowns thrown percentage, a 7.9 yards adjusted per attempt average, a 7.1 net yards gained per attempt, and a 7.0 adjusted net yards gained per attempt. He was also named the NFL MVP by the Associated Press, as well as the AP's Offensive Player of the Year, and the NFL MVP of the Newspaper Enterprises Association. After missing out on the Pro Bowl in 1975, he returned to it in 1976 with one of his better seasons. He led the NFL with career best marks of 27 touchdowns tossed, a 9.3 touchdowns thrown percentage, 228.1 yards thrown per game, 8.2 net yards gained per attempt, an 88-yard pass, and a quarterback rating of 103.4. His stellar season led the Raiders to Super Bowl XV, as he lost just one game he started all year, where the franchise won their first world championship. He was named the winner of the Bert Bell Award for NFL Player of the Year. After making the Pro Bowl for the final time of his career in 1977, Stabler continued to lead an aging Raiders team to winning records as it rebuilt. He left after the 1979 season for the Houston Oilers in a trade that brought Oakland quarterback Dan Pastorini. After a solid 1980 season for Houston, Stabler experienced his first year as a starter with a losing record in 1981. He joined the New Orleans Saints in 1982 and led them to a .500 record in two years before spending 1984 as a reserve. He retired after the season ended. There were few quarterbacks in Stabler's era with as much grit, intelligence, and desire as him. Though a free spirit off the field, Oakland knew he would lead his team to victory on the field. He won 69 of his 96 regular season starts and 7-4 in the postseason. Stabler was known to improvise, even if it meant breaking the rules, in order to win. Many opponents claimed he greased his jersey so he could slip out of their grasp. In a game in 1977 against the San Diego Chargers, the Raiders were down by six points with a few seconds left on the clock. They were in the red zone and Stabler was attempting to pass one as the clock was expiring. His receivers were covered, so Stabler fumbled the ball forward as he was being dragged down to the turf by a Chargers defender. Running back Pete Banaszak then batted the ball towards the end zone where tight end Dave Casper kick the ball into the end zone and fell on it. The Raiders won, despite the Chargers protesting the play. Stabler confessed later on that he fumbled the ball forward on purpose. The NFL rules committee soon placed a rule that no more â€œlmmaculate Deceptions," or â€œHoly RoIlersâ€ would be allowed ever again. The rule stated that on fourth down or any down in the final two-minutes of play, if a player fumbles, â€œonly the fumbling player can recover and/or advance the ball,â€ for the 1979 season. Many fans believe Stabler should be inducted into the Pro Football Hall of Fame, but critics point to his predecessor Lamonica. Not only did Lamonica get one more Pro Bowl and First Team All-Pro nod, he won three AFL titles. 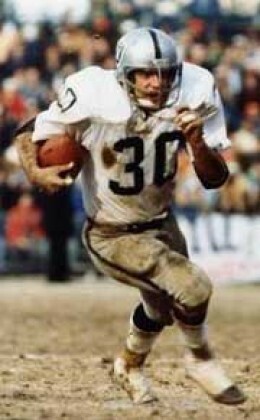 Lamonica's career yards passing and touchdowns thrown are very similar to Stabler, as well as the fact he won 62 of 84 starts for Oakland and was named AFL Player of the Year twice. Critics reason that Lamonica deserves induction into Canton just as much as Stabler, since he taught a young Raiders team how to win while Stabler stepped in with a seasoned roster. Yet "Snake" Stabler holds a special place in Raiders lore. He helped the franchise win their first Super Bowl and was part of the most historic plays in NFL history. He may be the best quarterback the team ever had. Daryle Lamonica, Cotton Davidson, Tom Flores, Jeff Hostetler, Jim Plunkett, and Rich Gannon deserve mention. van Eeghan was drafted by the Raiders in the third round of the 1974 draft. He was rarely used as a rookie, carrying the ball a career low 28 times. Starting eight games the next year, he impressed by averaging 4.4 yards per carry and cemented himself in the lineup. He soon became the cowbell of the Raiders offense. Beginning in 1976, van Eeghan had a string of three consecutive 1,000 yard rushing seasons. He led the charge against impressive run defenses like the Pittsburgh Steelers "Steel Curtain" and Minnesota Vikings "Purple People Eaters" as Oakland won Super Bowl XV. The 1977 season was his best. He set career highs with 324 carries for 1,273 yards. He ran in a career best nine touchdowns the following season. Though he never ran for 1,000 yards again, his 1979 was excellent. Besides rushing for 818 yards and seven scores, van Eeghan caught a career best 51 balls, he had caught a total of 75 balls his previous five years, and a career high two touchdowns. After churning out 838 yards in 1980, he spent most of the next year injured and had just 39 carries. He then joined the New England Patriots for two seasons before retiring after the 1983 season. van Eeghan was the Raiders all-time leader in rushing attempts and yards until Hall of Famer Marcus Allen surpassed him in 1987. He still ranks second, as well as tops amongst all Raiders fullbacks. His 35 rushing touchdowns ranks third best in team history. van Eeghan was the definition of a plow horse in football vernacular. He never took a ball longer than 34 yards, but his was consistent and averaged a solid four yards per carry for his Raiders career. He was also a solid blocker who often opened up holes for versatile halfback Clarence Davis. Davis was also a good blocker who complimented van Eeghan well enough to make the Raiders one of the NFL's true powerhouses of the 1970's. The Raiders have a deep stable of excellent fullbacks who wore their uniform, yet Mark van Eeghan may be the best that they ever had. Hewritt Dixon, whose four Pro Bowls are the most ever by a Raiders fullback, Alan Miller, Steve Smith, Jon Ritchie, Derrick Fenner, and Marv Hubbard deserves mention. Daniels was an undrafted free agent rookie who signed with the Dallas Texans of the American Football League in 1960. He spent that year backing up Rookie of the Year Abner Hayes. He was also used on defense and intercepted three passes. He was traded to the Raiders the next year and carried the ball just 31 times. Oakland liked what they saw, so he was elevated to the starting lineup in 1962 and scored a career best seven rushing touchdowns off of 761 yards. He then had perhaps the greatest season by a Raiders running back in 1963, where he made the first of four consecutive Pro Bowls and was named First Team All-Pro. He led the AFL with 1,099 rushing yards, 1784 yards from scrimmage, and 78.4 rushing yards per game while averaging a career best 5.1 yards per carry. He also led the AFL with a whopping 22.8 yards per catch average on 30 receptions, which is still a Raiders record for running backs with 30 receptions or more. Though he never ran for over 1,000 yards again, Daniels ran for over 800 yards in each of the next three seasons and matched his career high of seven rushing touchdowns in 1966. He was named First Team All-Pro that year as well. His 1967 season was cut short to nine games, though he did churn out 575 rushing yards. The Raiders would win the AFL title that year. It was his last year for the Raiders, as he joined the San Francisco 49ers the next year and carried the ball just 12 times in nine games before retiring. His 22.8 yards per catch average in 1963 has only been surpassed by Warren Wells, Mervyn Hernandez, Cliff Branch, and James Jett as the best ever by a Raider with at least 30 receptions. All four played wide receiver. Daniels ranks third in Raiders history in rushing attempts and yards, as well as sixth in rushing touchdowns. His 58.7 rushing yards per game is third behind Bo Jackson and Hall of Famer Marcus Allen. While he finished his career with the most rushing yards ever in AFL history, what made Daniels even more exceptional was his way to beat opponents several ways. He is a member of the AFL's All-Time Team. His 201 receptions are the third most ever by a Raiders running back and he averaged an excellent 16.4 yards per catch, an unheard of average for a running back. His 24 touchdown catches are the most ever by a Raiders running back and he completed four of nine passes for 143 yards. His 4.5 yards per carry average and explosive receiving ability show that Clem Daniels was a threat every time he touched the ball. He is certainly one of the greatest players the Raiders ever had play for them. Napolean Kaufman, Pete Banaszak, Bo Jackson, Kenny King, Clarence Davis, Tyrone Wheatley, Justin Fargas, and Charlie H. Smith deserve mention. Brown was selected sixth overall in the first round on the 1988 draft by the Raiders. He was used mainly as a return specialist as a rookie, but he did snare 43 catches and carry the ball a career high 12 times. He scored seven times that year, including the only rushing touchdown of his career. After missing all of 1989, except one game, because of injury, he was not used much on offense the next two years. That changed in 1992 when he started 12 of the 15 games at wide receiver. Now entrenched in the starting lineup, Brown made the Pro Bowl five straight years. He had 472 receptions over that time, including leading the NFL with 104 catches in 1993. Despite 81 receptions in 2002, his 1,000-yards streak ended with 930 yards that season. After 52 receptions the next year, Brown left the Raiders to join the Tampa Bay Buccaneers. He mostly was used as an extra receiver for the Bucs, though he did start four games. He had 24 receptions for just 200 yards and a score, prompting him to retire at seasons end. His 1,094 receptions for 14,934 yards are still the fourth most in NFL history. His 100 receiving touchdowns ranks sixth and he is fifth best ever in all-purpose yards. Tim Brown still hold most of the Raiders receiving records and might be the greatest wide receiver in that franchises history. Art Powell will slide in here when Brown is inducted into Canton. Branch was drafted in the fourth round of the 1972 draft by the Raiders. While catching just three balls as a rookie, he did return nine kickoffs for 191 yards and returned 12 punts for only 21 yards. He was never asked to return kicks again in his career. After 19 catches in his second season, Branch exploded onto the NFL scene. He had a career high 60 catches in 1974 while leading the NFL with 1,091 receiving yards, 13 touchdowns catches, and 78 receiving yards per game. It was the first for four consecutive years he went to the Pro Bowl. It was also the first of three straight First Team All-Pro nods. He led the NFL with 12 touchdown receptions and career high of 79.4 yards receiving per game in 1976, while averaging a career best 24.2 yards per catch. It was the only year of his career he exceeded 20 yards per reception, though he did average over 19 yards twice. The Raiders reached Super Bowl XI in 1976 and defeated the Minnesota Vikings 32-14. The 1977 season was his last as a Pro Bowler. Branch continued to be the Raiders best deep threat. They reached Super Bowl XV in 1980 after he averaged 19.5 yards on 44 receptions. Oakland made the playoffs as a wild card team and began a magical run. Branch had two touchdown receptions in Super Bowl XV, including the first score of the game, as the Raiders won 27-10. As he got older, it appeared Branch never lost his amazing speed. He tied a NFL record at the age of 35 in 1983 by taking a catch 99 yards for a touchdown. He had 14 receptions for 192 yards in the postseason while scoring a touchdown in Super Bowl XVIII. Oakland would win the title with a 38-9 thumping of the defending champion Washington Redskins. After 27 receptions in 1984, he appeared in four games during the 1985 season and failed to record a catch for the first time in his career. He retired after that, but did play the 1988 season for the Los Angeles Cobras of the Arena Football League before retiring permanently. He has the third most receptions, receiving yards, and touchdown catches in Raiders history. This was done while maintaining an impressive 17.3 yards per catch average. Cliff Branch has been a semi-finalist for induction into the Pro Football Hall of Fame twice. He was blazing fast with sure hands, making him one of the greatest wide receivers on Raiders history. Art Powell, Warren Wells, Bo Roberson, James Jett, and Jerry Porter deserve mention. Christensen was drafted in the second round of the 1978 draft by the Dallas Cowboys, who put him at fullback. He broke his foot in a preseason game and was cut. The New York Giants signed him as a fullback in 1979 but cut him after he appeared in one game. The Raiders signed Christensen and moved him to tight end. He caught just eight balls in his first three years with the Raiders while taking a fumble recovery in for a touchdown, which includes their Super Bowl XV winning season in 1980. He began to get the ball in the strike-shortened 1982 by catching 42 balls in nine games. It set the stage for maybe the finest season of his career. Christensen led the NFL with 92 receptions. He set career high marks of 1,246 receiving yards and 12 touchdowns. He was named First Team All-Pro and made the first of five straight Pro Bowls. His performance helped carry the Raiders to Super Bowl XVII. He led the Raiders with 14 catches, tied with Cliff Branch, in the postseason as the Raiders would win the world championship. From 1983 to 1986, Christensen had 349 receptions. It was an NFL record at the time. His next two years were cut short by injuries, limiting him to 62 catches in 19 games. He retired at the end of the 1988 season. The 461 receptions for 5,872 yards and 41 touchdowns by Christensen are the most ever by a Raiders tight end. He has the fourth most receptions and receiving yards in Raiders history, as well as the sixth most touchdown catches. His five Pro Bowls is tied with Hall of Famer Dave Casper as the most ever by a Raiders tight end. His two First Team All-Pro nods is second most behind Casper's five. Some will say Todd Christensen is the greatest tight end the team ever had. Raymond Chester, Ethan Horton, and Billy Cannon deserve mention. Schuh was the Raiders first-round draft pick in 1965. Frank Youso began the year as a starter, but Schuh soon replaced him and would remain a starter the rest of his Raiders career. He made his first Pro Bowl in 1967 while helping the Raiders win the AFL title. He returned to the Pro Bowl in 1969 while being named First Team All-Pro as well. Schuh made his last Pro Bowl in 1970, but was then traded to the Los Angeles Rams for Hall of Fame tackle Bob Brown. He played three years for the Rams before joining the Green Bay Packers in 1974. The Packers moved Schuh to left tackle that year, where he split starts with Keith Wortman. Schuh then retired at the conclusion of the season. Harry Schuh was the first Raiders offensive tackle to go to a Pro Bowl and be named First Team All-Pro. His three Pro Bowls are still the second most in team history. He is the greatest right tackle in Raiders history. Kennedy was drafted in the first round of the 1993 draft by the Atlanta Falcons with the ninth overall selection. After starting guard in his rookie year, he lost his starting job the next year and remained mostly a reserve until after the 1994 season. He was traded to the Raiders before the 1995 season and quickly won the starting job at left tackle, which he would hold onto most of the rest of his career. He would make the first of three consecutive Pro Bowls in 2000. Kennedy's 2002 season may have been his best. He made his last Pro Bowl while earning his only First Team All-Pro honor. It helped the Raiders reach Super Bowl XXXVII. He appeared in just 12 games in 2003 because of injuries, starting in 10, and decided to retire. He later attempted a comeback with the Dallas Cowboys in 2005, but was cut in training camp. He then played for the Tampa Bay Storm of the Arena Football League in 2007 before retiring permanently. Lincoln Kennedy's three Pro Bowls is tied with Harry Schuh as the second most ever by an offensive tackle in Raiders history. He is a player whose career was resurrected by the Raiders, something the team has often done, to become one of the finest blockers in that teams history. Henry Lawrence, Bruce Davis, Bruce Wilkerson, and Barry Sims deserve mention. Wisniewski was drafted with the first pick in the second round of the 1989 draft by the Dallas Cowboys. He was quickly dealt to the Raiders in one of the most lopsided trades in NFL history. The Raiders got themselves a guard who started immediately and would start every game but two for the next 13 years. After playing right guard as a rookie, he moved to the left side in 1990 and stayed there the rest of his career. The move worked out for both Wisniewski and the Raiders. He was selected to the first of six straight Pro Bowls on 1990 and quickly developed a reputation as one of the very best guards in the entire NFL. He was named First Team All-Pro in 1991 and 1992. He was considered tough and surly, playing with a real mean streak that had opposing defensive tackles rue the days they had to square off against him. After missing the Pro Bowl in 1996, he went back in 1997. He was passed over the next two years before returning for the final time in 2000. He retired after the 2001 season having started in every game he played in. A decade after retiring, Wisniewski has returned to the Raiders as an offensive line coach. He will be coaching his nephew Stefen Wisniewski, whose dad Leo is Steve's older brother. Leo Wisniewski was an excellent NFL defensive tackle who had his career cut short by injuries. Many Raiders historians consider Hall of Famer Gene Upshaw the greatest guard the team has ever had. Yet Steve Wisniewski went to eight Pro Bowls, one more than Upshaw. It is the most Pro Bowls ever by a Raiders guard. One day Steve Wisniewski will be inducted into the Pro Football Hall of Fame. Not only was he a fine technical blocker against the pass, but he was an absolute mauler run blocking. He frequently was seen pancaking his opponents into the turf with ferocious desire. He may be the greatest offensive guard in the history of the Raiders and he is a member of the NFL's 1990s All-Decade Team. Hawkins was originally the first selection of the Denver Broncos in the 1960 AFL territorial draft, but was soon selected by the Raiders in the allocation draft of the fledgeling league. John Dittrick, one of just four veterans who started games on offense that year, split a few starts with Hawkins that year. The rookie soon grabbed the job and would hold it until 1967. After starting at right guard his first three seasons, Hawkins moved to left guard in 1963 and earned the first of five straight Pro Bowl nods. He moved back to right guard the next two years before playing on the left side in 1966. Moving back to the right side in 1967, helping Oakland win the AFL title, he made his last Pro Bowl. His 1968 season was racked by injuries and he played just 10 games while second-year player Gene Upshaw, a future Hall of Famer, took over at left guard. After spending 1969 on the bench, he retired having played his entire career with just the American Football League. He is one of only 20 men to have done this. His five Pro Bowls was a record for a Raiders guard until Upshaw surpassed him in 1975 and it is still the third most ever in franchise history. Wayne Hawkins is a member of the Raiders All-Time Team and is one of the best guards to have ever played for them. George Buehler, Max Montoya, Kevin Gogan, Charley Hannah, Mickey Marvin, and Jim Harvey deserve mention. Mosebar was drafted by the Raiders in the first round of the 1983 draft. He spent his rookie year on the bench learning from veteran Pro Bowler Dave Dalby as the Raiders would end up winning Super Bowl XVIII. He played right guard the next year and started in the 10 games he played. He took over for Dalby in 1985 and would be named to the Pro Bowl in 1986. Mosebar quickly showed his athleticism and versatility. He played left tackle for the Raiders in 1988 before moving back to center for the rest of his career. The pinnacle of his career came in 1990 and 1991 when he was named to the Pro Bowl each year. He was the starter until the 1994 season and was annually considered one of the best centers in the NFL. As he prepared for the 1995 season, he was accidentally poked in the left eye in practice. The injury was so severe that he lost sight in the eye and was forced to retire. His retirement ended a magnificent run at center for the Raiders. Hall of Famer Jim Otto, Dalby, and Mosebar were the main starters at center for 34 straight years, minus the 1988 season where Mosebar played tackle and Bill Lewis played center. Otto might be the greatest center ever, and Dalby was fantastic in his own right, but Mosebar's three Pro Bowls is second to Otto as the most ever by a Raiders center. His ability to play all over the offensive line, even at left tackle, also is an example of his greatness and gives him this slot. Dave Dalby and Barrett Robbins deserve mention. Jaeger was drafted by the Cleveland Browns in the 1987 draft. Despite playing in just 10 games because of a players strike, he set a franchise scoring record by a rookie with 75 points. Yet Cleveland replaced him with veteran Matt Bahr the next year and Jaeger spent the season out of football. He signed with the Raiders and replaced Chris Bahr, the older brother of Matt. Handling the placekicking duties over the next seven years, Jaeger led the team in scoring for five consecutive years. He scored at least 103 points three times and was considered one of the better kickers in the AFC. Jaeger made his only Pro Bowl in 1991, where he was also selected First Team All-Pro. His 85.3 field goal percentage that year was a career best mark. His best season may have came in 1994. He led the NFL with a career best 132 points, while also leading the league with 44 field goal attempts and 35 makes. Gary Anderson, of the Pittsburgh Steelers, was chosen to the Pro Bowl ahead of Jaeger after missing just two kicks all year. After missing five games because of injuries in 1995, Jaeger joined the Chicago Bears the next year. He was effective for three seasons before getting replaced after third game of the 1999 season. He then retired. Jaeger ranks fourth in Raiders history in points scored, field goals attempted and made, and extra points attempted and made. His 132 point season in 1993 was a team record until Sebastian Janikowski broke it in 2010. He is still the only placekicker in Raiders history to be named to the Pro Bowl or be named First Team All-Pro. His 44 field goal attempts and 35 makes in 1991 still stand as team records. George Blanda may be the best kicker in team history, as the Hall of Famer seemed to always come through in the clutch. Janikowski is setting team records and seems to have several years ahead of him. Yet Jeff Jaeger is chosen to man this position because he is amongst the best placekickers in Raiders history. Carr is still active, so there is a chance he returns to Oakland. Yet we place him here because of his statistical dominance as a kickoff returner in Raiders history at this moment. He made the team as an undrafted rookie free agent for the Raiders in 2005. He earned the job as the return specialist. While he did return 77 punts over three years for the Raiders, he averaged just 5.9 yards per return. Returning kickoffs is where he excelled. Carr led the NFL in kickoff returns and kickoff return yards in each of his first two seasons. He ranked fourth in returns and seventh in return yards in his third season. Carr also began to see time as an extra defensive back for the Raiders. In 2006, he picked off a pass and ran 100 yards for a touchdown. It was his only interception with the Raiders. He left Oakland after the 2007 season and spent a year with the Tennessee Titans. It was his last year as a full-time kickoff returner. Carr joined the Baltimore Ravens in 2009 and returned 32 punts while picking off a career best two passes. He was rarely used on special teams in 2010, returning four total balls, as he became a starting cornerback for the Ravens and intercepted two passes. Carr is expected to duplicate that role when football resumes. Carr has the most kickoffs and kickoff return yards in Raiders history. His return average was a healthy 24.1 yards per return. He ranks third best in all-purpose yards as well. Though he may not be the flashiest kick returner in Raiders history, Carr's stats place him on top of the franchise list as one of the best. Bo Roberson, George Atkinson, Terry Kirby, Justin Miller, Napoleon Kaufman, Tim Brown, Rocket Ismail, and Clarence Davis deserve mention.